The Ricardos and the Mertzes are in San Diego while Ricky rehearses with Maurice Chevalier for a show to be presented aboard a U.S. Navy aircraft carrier, the Yorktown. Lucy and Ethel are eager to go across the Mexican border into Tijuana for some souvenir and bargain-hunting, so Ricky deputizes Fred to go along and keep the girls in line. Lucy, however, quickly becomes embroiled with the U.S. Customs officer when a little Mexican lad tries to stow away in her automobile trunk, in order to see, firsthand, "a real-life aircraft carrier." Lucy and the Mertzes seem destined for a real-life jail term, until Ricky and Maurice arrive to bail them out. But further complications arise when Maurice, a French citizen, cannot get back into the United States without proper authorization. Lucy sets out to find the American consul, who is attending an afternoon bullfight. The border police are in pursuit, so Lucy disguises herself as a matador, and winds up in the ring with the ferocious bull. Special Notes: This was the first episode sponsored by Westinghouse. Ford Motor Company only sponsored the first 5 episodes. 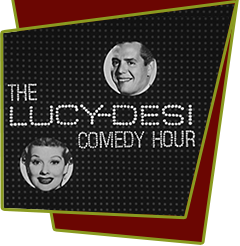 Westinghouse used the program to promote their “Westinghouse Desi and Lucy Fiesta of Values” promotion with a 3 minute commercial featuring Betty Furness and the series cast. Although Lucy and Desi are referred to by their real names, Vivian Vance and William Frawley are still called Fred and Ethel. Bloopers: When filming this episode, the mechanical bull malfunctioned and jumped off the tracks, while Lucy was on it. She credits director Jerry Thorpe with "saving her life".